@CoachChic to @larrymwalkerjr Tell me: If Obama wants us to buy-into a healthcare package, why not just give us what congressmen get? I’m serious here. With more than 1.8 million civilian employees, (1) the Federal Government, excluding the Postal Service is the Nation’s largest employer. The U.S. Postal Service employs an additional 636,000 (2) full-time employees. Politicians and Federal employees receive the country’s best care – at taxpayers’ expense. While over 46 million Americans (disputed) remain uninsured and millions more underinsured, members of Congress receive health-related services that many in the U.S. will never see. Representatives and Senators alike receive some of the best health care benefits in the country, much of it paid for with taxpayer dollars. Yet these same members seem unable – or unwilling – to extend similar protections to the rest of America. As soon as members of Congress are sworn in, they may participate in the Federal Employees Health Benefits Program (FEHBP). The program offers an assortment of health plans from which to choose, including fee-for-service, point-of-service, and health maintenance organizations (HMOs). In addition, Congressional members can also insure their spouses and their dependents. Not only does Congress get to choose from a wide range of plans, but there’s no waiting period. Unlike many Americans who must struggle against precondition clauses or are even denied coverage because of those preconditions, Senators and Representatives are covered no matter what – effective immediately. And here’s the best part. The government pays up to 75 percent of the premium. The government, of course, is funded by taxpayers; the same taxpayers who often cannot afford health care for themselves. For non-Postal Employees, let’s use the federal government’s Georgia rates for Humana’s Standard Plan for self-only coverage. The total monthly premium in 2009 is $373.75. The amount paid by the employee is $93.44. The amount paid by taxpayers is $280.31 (3). For Postal Employees, let’s use the federal government’s same Humana Standard Plan for self-only coverage. The total monthly premium in 2009 is $172.50. The amount paid by the employee is $23.29. The amount paid by taxpayers is $149.21 (4). For non-Postal Employees let’s use the federal government’s Georgia rates for Humana’s Standard Plan for Family coverage. The total monthly premium in 2009 is $859.67. The amount paid by the employee is $214.92. The amount paid by taxpayers is $644.75 (3). For Postal Employees let’s use the federal government’s same Humana Standard Plan for Family coverage. The total monthly premium in 2009 is $396.77. The amount paid by the employee is $53.56. The amount paid by taxpayers is $343.21 (4). Depending on the plan, and the State, the costs vary widely, but at the minimum, using Georgia’s insurance rates, which are among the lowest nationwide, taxpayers are on the hook for somewhere between $7.1 billion and $16.5 billion annually. Based on the rates in other states I think it would be safe to double these amounts. So let’s say it costs taxpayers between $14.2 billion and $33.0 billion per year to subsidize health insurance premiums for Federal Employees. 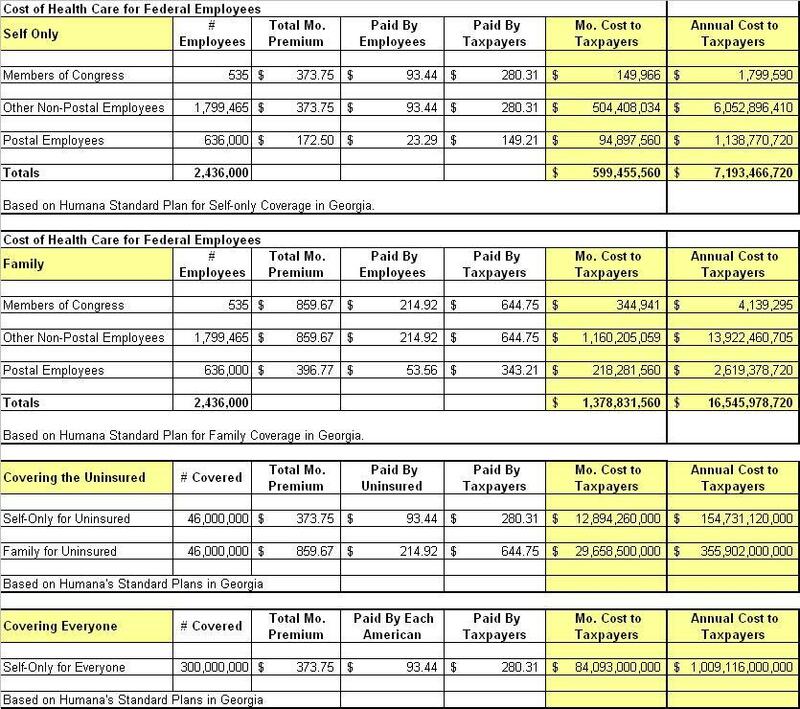 Again doubling the Georgia rates, health insurance subsidies for the 535 members of Congress cost taxpayers between $3.6 million and $8.2 million annually. 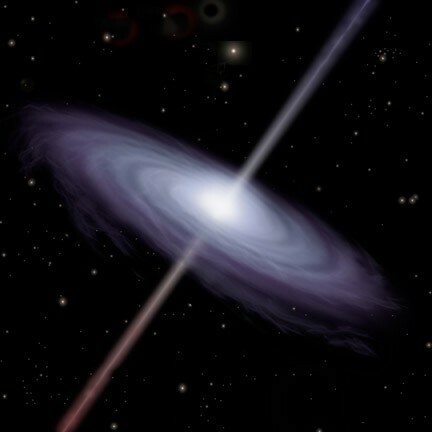 To me this is a Black Hole. We pay for our own health insurance, and then we turn around and pay 75% of the cost for federal workers. Members of Congress and the Executive Branch need to start pulling their own weight. Especially since all they seem to be doing lately is spending money that we don’t have. Option 1: How much would it cost if the Congress were to grant the same health insurance plan that government workers enjoy, to the alleged 46 million uninsured? If the government paid 75% of the premiums for the uninsured, the minimum cost to taxpayers would be somewhere between $154.7 billion and $355.9 billion. Since Georgia rates are about half of what they are in most States, the average is more reasonably, between $309.4 billion and $711.8 billion. Using the high-end figure of $711.8 billion, that’s about $2,372 per capita, annually. Option 2: How much would it cost if Congress were to grant all 300 million of us access to the same 75% subsidized plan enjoyed by government employees? The cost to taxpayers would be just over $1.0 trillion at Georgia rates, or more like $2.0 trillion nationwide. Using the high-end figure, again, $2.0 trillion is about $6,727 per year, per capita. Thus it is unlikely that the nation could afford to offer all American’s access to the same kind of taxpayer subsidized health care which Federal employees receive. With the government paying 75% of the premiums, it would cost taxpayers around $2.0 trillion, or $6,727 per citizen, per year. And then we would still be responsible for 25% of the premiums. As a Georgia resident, although my monthly premiums would only be perhaps $93.44, my taxes would increase by potentially $6,727 per year to subsidize everyone else. Thus, it would wind up costing me $7,848 per year, or $654 per month. For a family of four, the cost would be roughly $2,616 per month ($654 * 4). The average cost nationwide would be double the premium or $747 per month for individuals, and $2,990 per month for a family of four. Now that’s just outrageous. Once again, I would conclude that it’s probably best to make some reforms to the current system, and not attempt any kind of radical ‘fundamental’ changes. However, one thing we can and should do right away is end the notion of taxpayer subsidized health insurance premiums for Federal Employees. We have to pay for our own insurance and then for 75% of theirs? This can and should end immediately, starting with the Black Hole – Congress, and the Executive Branch. RT @CoachChic @HeavenandHealth My plan: Have pols design a healthcare plan, then join us in it. Fair enough? A good post on Natural Born Conservative.I did come across a blog http://israel.buildlastingsuccess.com. It’s all about starting home business based on insurance and legal plans for a 36 year old cash-rich company. It is publicly traded on the New York Stock Exchange, and reports directly to the Securities & Exchange Commission. Their 15 consecutive years of RECORD growth… is 100% verifiable!